Happy Holi to all my viewer here !!! In Odisha, the Holi festival'll celebrate tomorrow. And for the celebration, I have prepared again a sweet dish as Kesar Phirni with Thandai Crust. Phirni is a very popular North Indian sweet delicacy particularly from Punjabi cuisine, made with rice flour and milk as the main ingredients. Phirni is usually prepared during festivals like Holi, Lohri, Diwali, Baisakhi, Eid etc. This traditional sweet dish is a simple yet delicious recipe, which can be prepared in just a few minutes if all the ingredients are in place. What makes this rice delicacy different from Kheer and other Indian desserts is the rich & creamy texture of the delicacy that is prepared with rice blend and infused with aromatic essence. Actually there are several versions of this such as Badam Phirni, Sooji phirni, Kesar Phirni, Apple Phirni and many more. I have prepared kesar phirni with some rose flavor here. 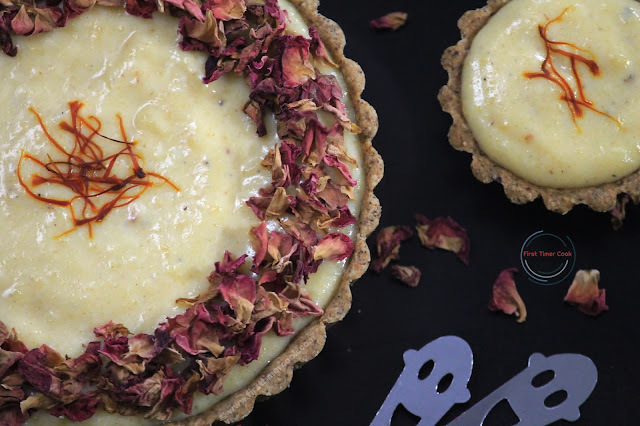 Since the colorful festive time is going on, so instead of serving this sweet dessert in a serving platter I have filled this phirni in a crust made out of thandai powder. For the crust I don't prefer to use any other flour, just use only my homemade thandai powder. But if the binding of crust seems difficult then 1-2 tsp wheat flour can be added to the thandai powder. The process is so easy and this delicious and flavorful dessert will be loved by all age group. 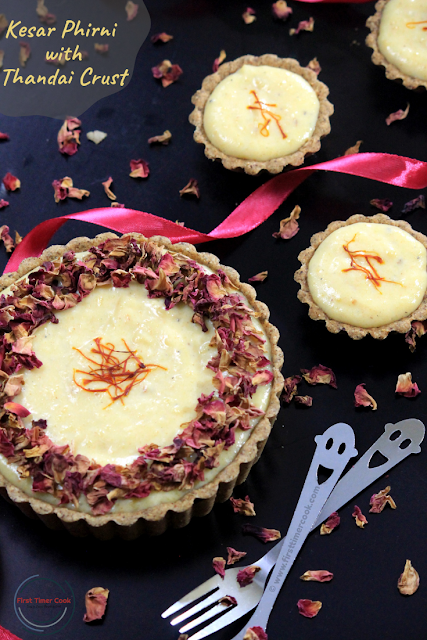 So do try this indulgent dessert today and relish with your loved ones. Some other Holi special dishes which you may have interest to try are Thandai Lassi, Rasmalai, Puran Poli, Thandai (Boiled milk + thandai masala powder), Kiwi Pistachio Lassi, Apple Pie Gujiya, Thandai Rabdi, Bhune Chukandar Masala Chaas etc. In a heavy bottom pan, take first milk and start boiling. Put saffron strands and 1 tbsp milk in a small bowl and mix well. Keep aside. Then add sugar and simmer for 10 minutes, stirring occasionally. Next add rice flour little by little and stir continuously using a hand whisk so that no lumps will form. Cook till the desired consistency of the phirni reached. Finally add rose water, saffron milk. Give a nice stir and turn off heat. Cover the pan and keep aside to cool completely. Now in a mixing bowl take thandai powder, brown sugar, salt and butter. Rub everything with fingertips and mix well to make a dough like structure. Put some portion of the dough in the greased tart pan and press all around starting from side to bottom of the pan. Prick the bottom of the tart with a fork. Meanwhile, preheat the oven at 200 deg C.
Put tart pan in the refrigerator for 10 minutes and then bake for 15 minutes or till the crust is firmed up well and golden brown in color. Remove the tarts from the oven and cool down completely on a wire rack. Fill the tarts with keshar phirni and refrigerate for 30-45 minutes. 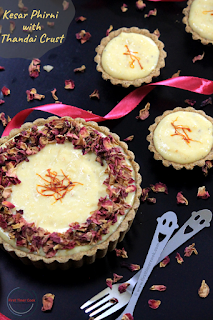 Sprinkle some rose petals, chopped nuts and saffron strands on top and serve ! If still any issue is there while making the tart, then add 1-2 tsp of wheat flour to the dough. I love trying foods of the world. This looks and sounds delicious. It would be a great addition to the brunch menu too. Your kesar phirni with thandai crust is beautiful. I really like how you decorated with rose petals. Very pretty. This looks like a delicious sweet treat! I hope that you enjoy the festival! I have read about it before and it looks like a wonderful time! Your Kesar Phirni with Thandai Crust is just delicious! These are new flavors for me and I love it! Perfect with a cup of tea! What a lovely and delicious dessert! I love how creamy the filling is. Thanks so much for sharing! I hope you had a wonderful celebration! This recipe looks amazing and something I would definitely love to try soon! Your kesar phirni looks stunning! It could easily be the highlight of any dinner - fantastic recipe that looks amazing! I don’t know about thandai powder until I read your recipe. Great dessert 😋. 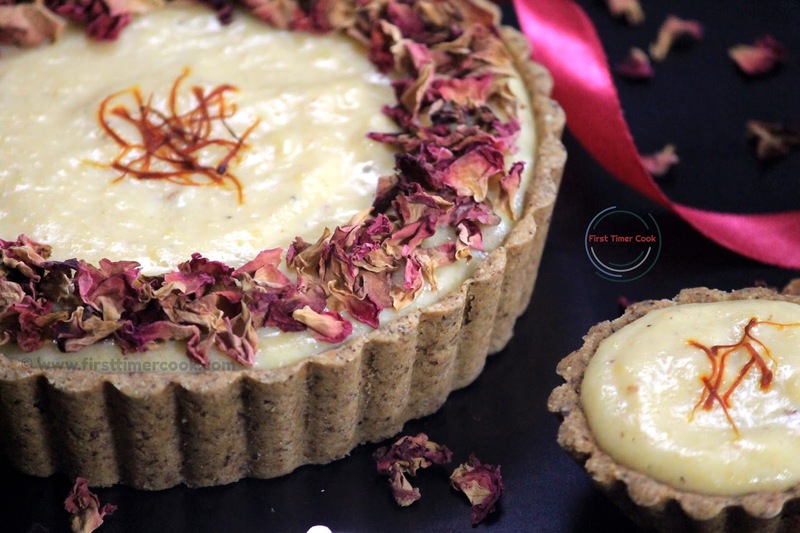 This looks so stunning.. loved this fusion..The recipe sounds so flavourful with thandai masala in phirni and crust.